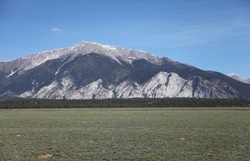 Mount Princeton with Chalk Cliffs on the lower right. Chalk Cliffs is one of the most active debris flow sites in the world, and on average produces one to four debris flows annually. The Terrain Analysis Lab (TAL) at East Carolina University has surveyed Chalk Cliffs with Terrestrial Laser Scanners eight times, capturing surface elevation changes of seven debris flow events. In July of 2010, I traveled to assist with Terrestrial Laser Scanning a recent debris flow event. Using the same control network used at the GAP fire site, the surveys of the channel networks and alluvial fan were referenced and compared with past surveys. These repeat surveys provide an assessment of patterns of debris flow deposition and erosion.